Thanks to Jan from Belgium who sent me this terrific map of central Athens after realizing this was one thing my Athens Guide was missing. 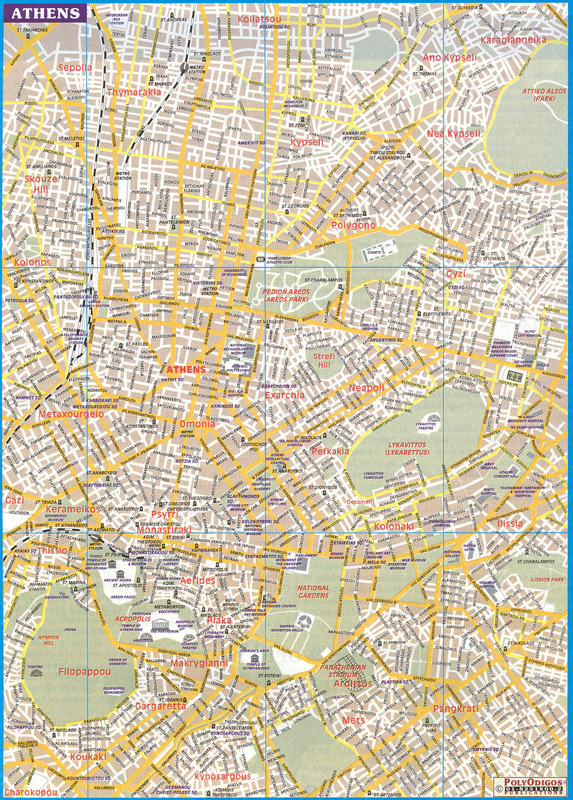 You can also get free maps from the GNTO (Greek National Tourist Organization) office at 18-20 Dionysiou Areopagitou Street about 100 meters from the Acropolis Museum. Or at least you used to be able to. The last time I went they were out and the woman did not know when or if they were reprinting them. Let me know if you go there. For the best selection of Guidebooks and maps go to Ekdoseis Infognomon at 14 Filellinon just three blocks up from Syntagma Square across the street from Fantasy Travel. 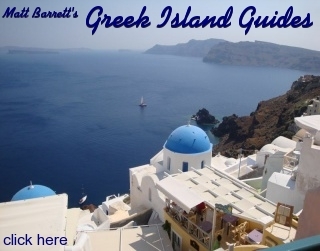 They have maps of all the islands, Greece maps, Athens street maps, and all the popular Guidebooks as well as maps and Guides for other countries. I have also found maps in Barnes and Noble and other major bookstores in the US and abroad. Something handy to have with you when you get hold of a good map is a compass. Yes, I know. You have never used a compass before but don't be afraid. They are very simple and all you have to remember is that the needle always points north. So you line up the needle with the N and look at your map and you can see where you are and in which direction you need to walk in. Very handy. Even on the islands. This helpful advice comes from Trent Spradling, of Eugene Oregon and the first thing I am going to do is go and buy one for myself.